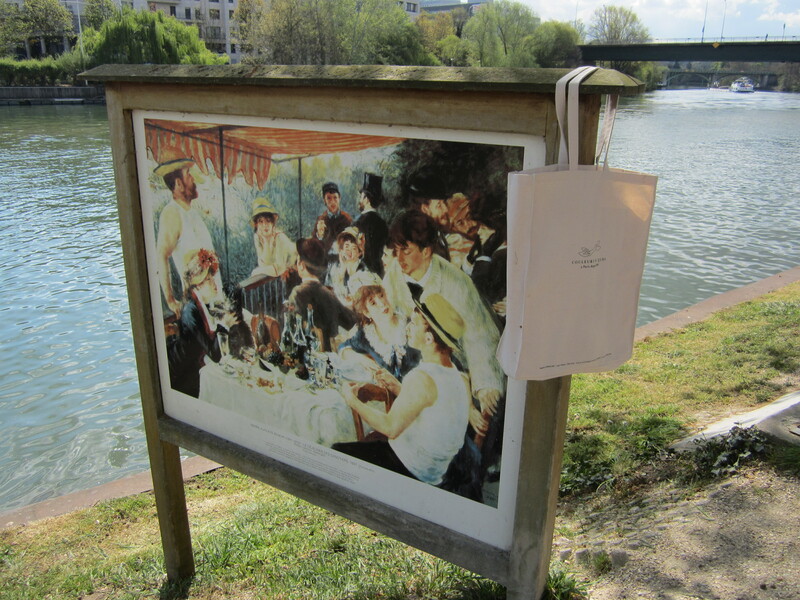 Renoir’s Luncheon of the Boating Party (1880-1) makes me want to pull up a chair, sit down next to Gustave Caillebotte (right foreground) and pour myself a glass of wine. Maybe I would even feed the doggie some grapes and chat with Aline Charigot, Renoir’s future wife (the pretty woman in the red-flowered hat). 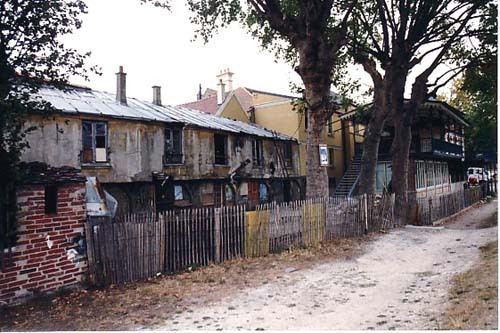 Maison Fournaise before renovation. From the restaurant’s website. 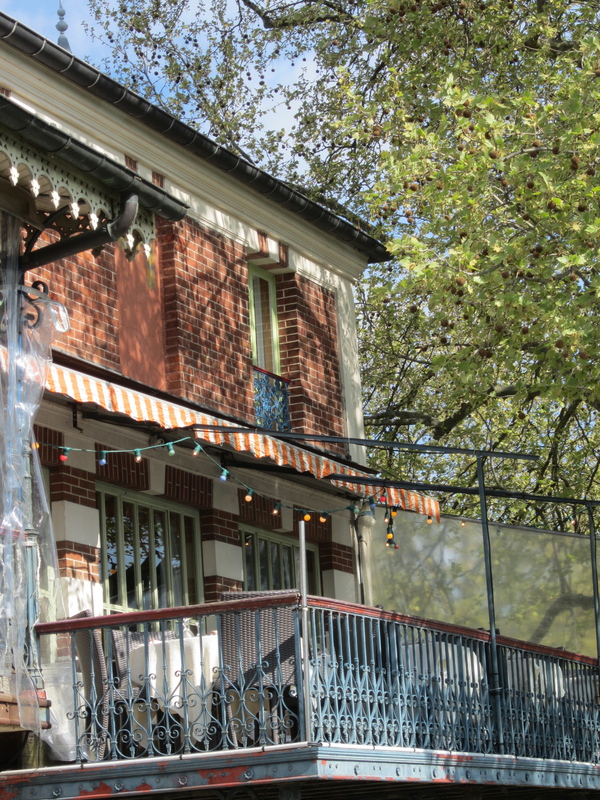 From 1984 to 1990, the restaurant was completely renovated with a combination of art grants and philanthropy. Today, the scene is much improved. 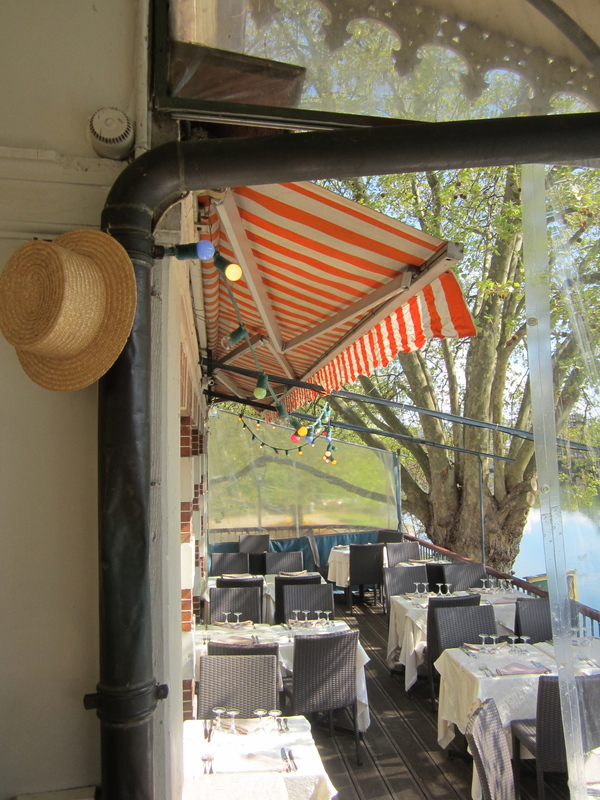 Renoir’s balcony still stands, complete with the orange striped awning. The view from Renoir’s easel. 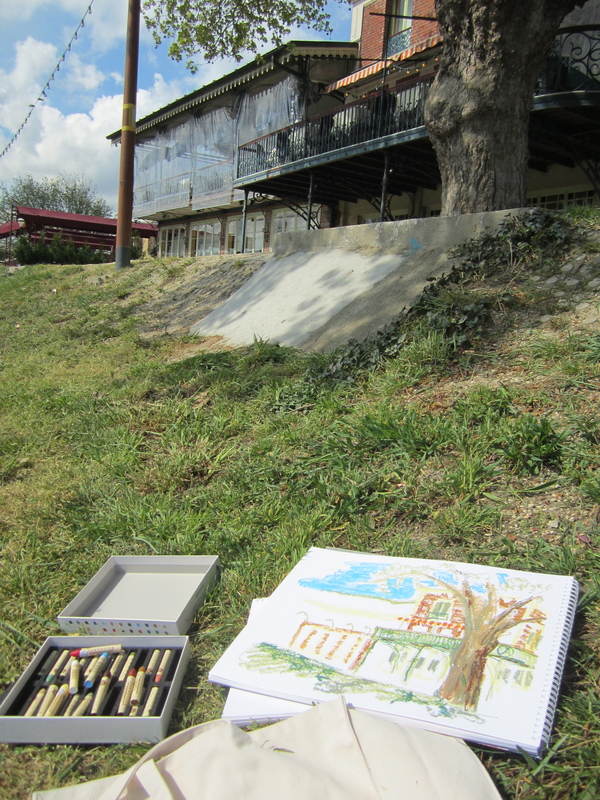 I even brought out my own pastels and tried to capture the scene, but alas, I’m no Renoir. My art bag and I were here. . . . I just wish some “Midnight in Paris” magic would transport me back to the day. . . .
You can read an imagined story of the couple’s developing romance in Luncheon of the Boating Party by Susan Vreeland, who said that she had often admired the painting and wondered about the models. Who were they, and why did they pose like they did? 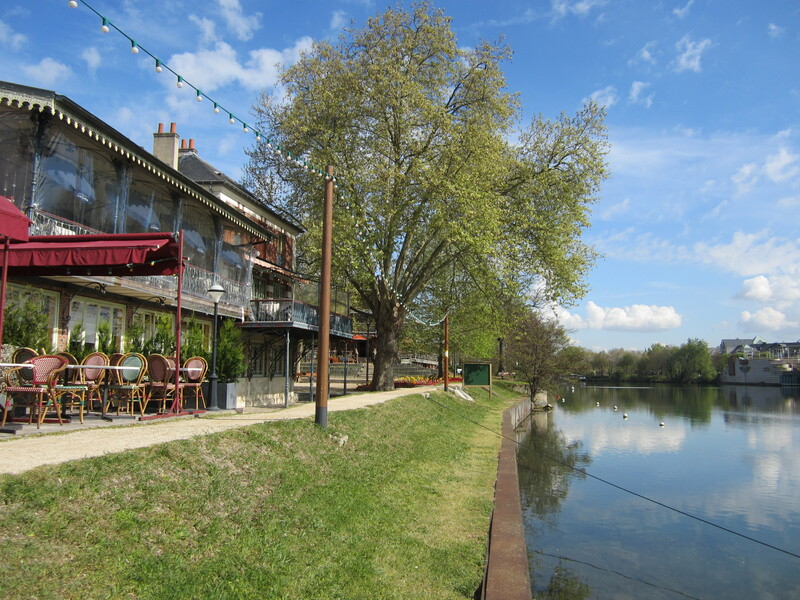 “I saw tremendous story potential in these appealing characters, flushed with pleasure and enjoying a summer day on a terrace overlooking the Seine.” Vreeland imagines a love triangle between Renoir, Aline, and another woman in the painting, Alphonsine Fournaise, the daughter of the restaurant owner. 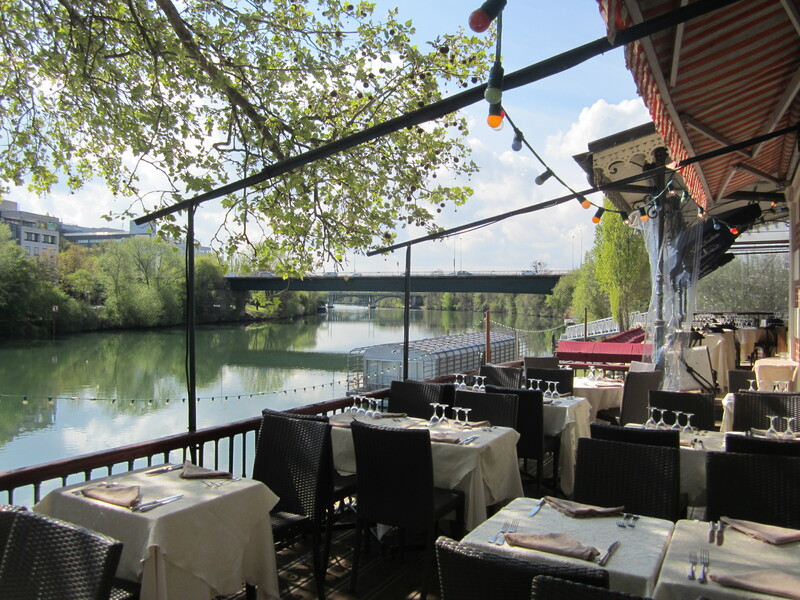 You can enjoy your own toast to Renoir and his women at the restaurant, where they offer an apertif called “The Alphonsine,” made of orange juice, champagne and grenadine. My own book club back in Chicago read and enjoyed Susan Vreeland’s book, which I highly recommend. 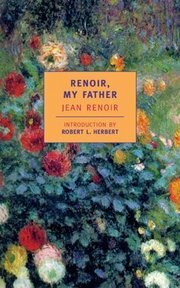 Right now, I am in the middle of Renoir, My Father by Jean Renoir, and I am pleasantly surprised what a good read it is. Jean’s memory was incredibly good, his writing is thoughtful, and the stories his father used to tell him make captivating history. If you or your book club can’t get to Paris, maybe you can schedule a visit to the Phillips Collection in Washington, D.C. to see the original painting. At the Art Institute of Chicago you can see another of Renoir’s paintings from Chatou called Lunch at the Restaurant Fournaise (The Rower’s Lunch) (1875). At the very least, you can enjoy some art history at the website of Maison Fournaise here. This entry was posted in Art History, Art History Site, Book Review, Literary Site, Paris Books, Paris History Site and tagged Aline Charigot, Alphonsine Fournaise, Art Institute of Chicago, Book club travel, Chatou, Gustave Caillebotte, Jean Renoir, Luncheon of the Boating Party, Maison Fournaise, Paris, Paris Literary Tours, Phillips Collection, Renoir, Susan Vreeland by americangirlsartclubinparis. Bookmark the permalink. I too am in the middle of Renoir, My Father, and it is a great read. The stories Renoir had are so remarkable, and I enjoy reading about the more human side of this artists worshiped my so many today. Great post and sketch! Thanks for allowing me to see this iconic location! 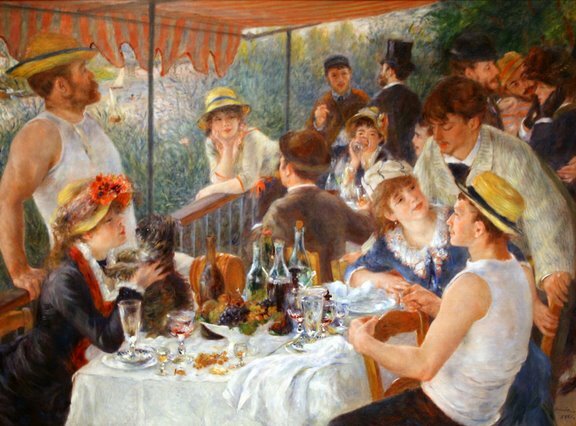 I bet the prices at the cafe are much higher now because of Renoir. 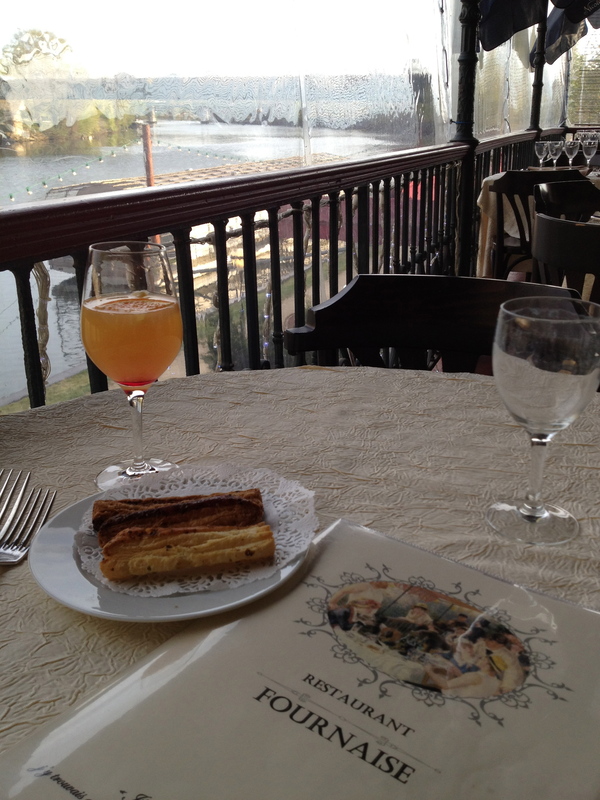 Thanks for providing the details on how to get to the Restaurant de la Maison Fournaise. I shall have to follow in your and Renoir’s footsteps, although I won’t be taking my own pastels!